Hailey & Donnie had a beautiful morning wedding at Casa Muy Grande in Playa Grande. They opted for an intimate guest list consisting of only their parents and siblings. 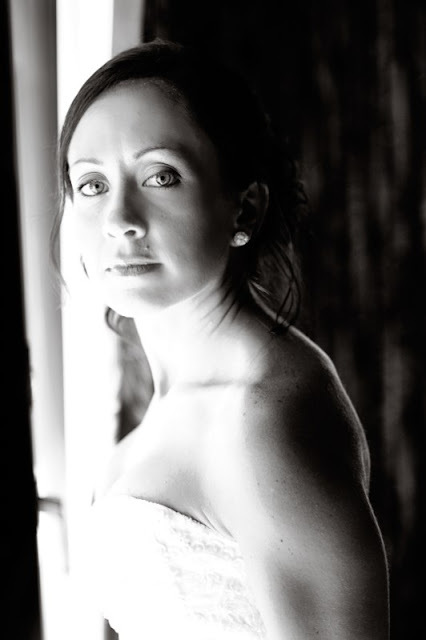 When we got the call for an October wedding (the rainest month of the year here) I kept my fingers crossed for sun. 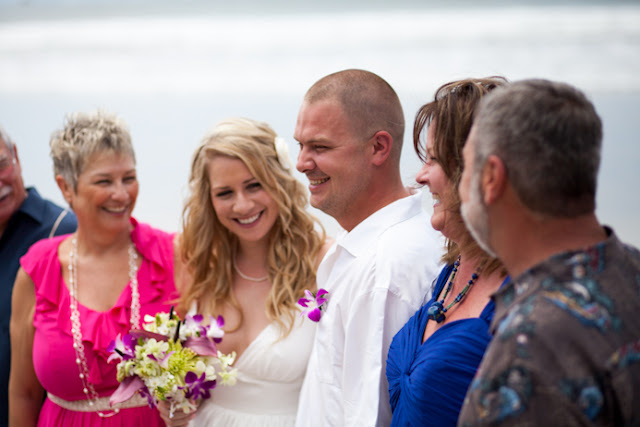 As the wedding Gods would have it, Costa Rica sunshine beat down all day like the middle of summer! It was meant to be! 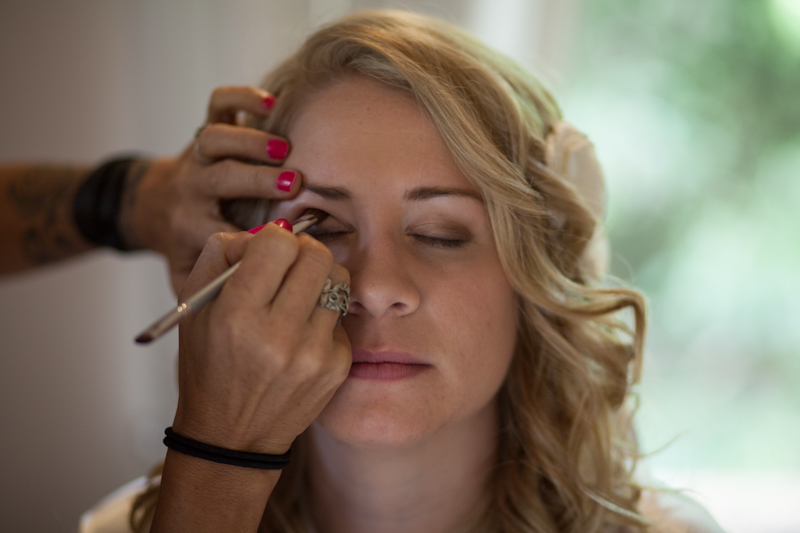 We had a great time chatting with Hailey, her mom and her (almost) mother-in-law while getting her ready. Both sets of parents have been married over 30 years and her in-laws were actually celebrating their anniversary on this trip. 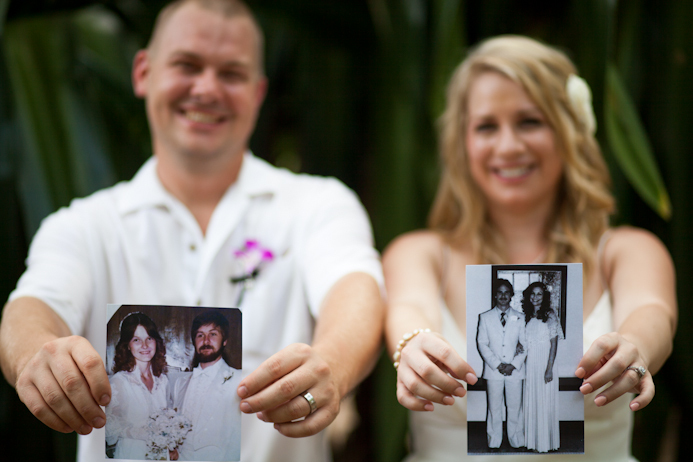 I love this photo that they took of them holding their parents' wedding photos! 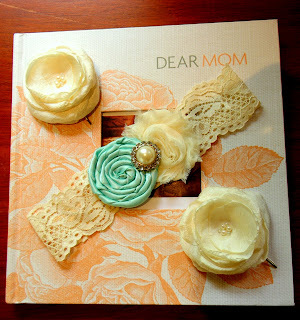 She's also a big lover of handmade goodies and found her garter and hair flowers in Sara's Boutique on Etsy. 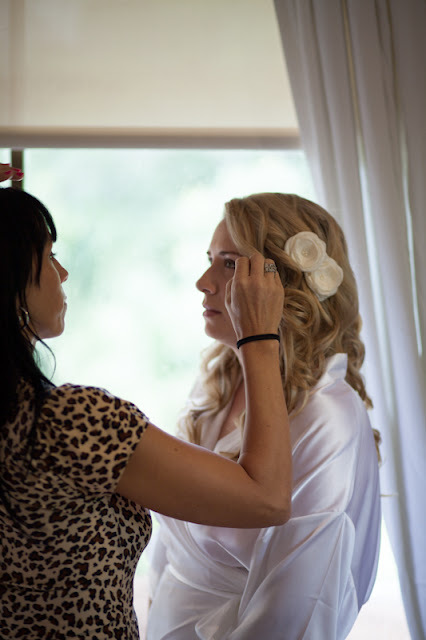 Being an early day wedding, Hailey wanted her hair down with soft curls, and her make-up soft, yet accentuated. We used Urban Decay's Virgin, Sin, Smog and Sidecar eye shadow along with dark brown and black cake liner to create this look. 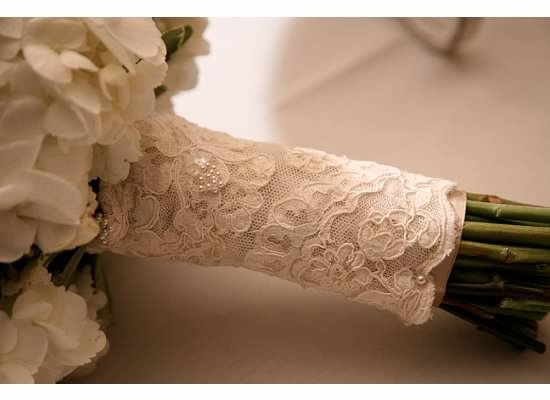 Simple, inexpensive and lovely lace wrapped flower stems. A bride recently used a wrap similar to this and slipped her grandmother's locket inside - the "something old". 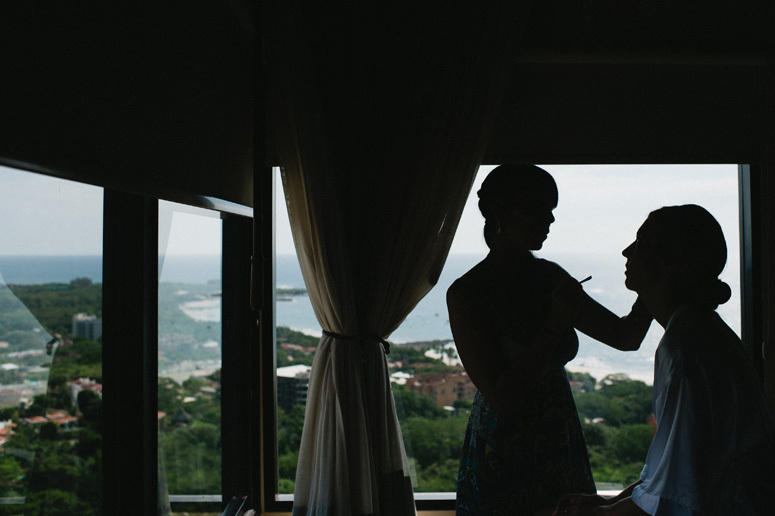 Sarah & Travis tied the knot at Villa Paraiso, which is one of my favoooorrite locations in the area. 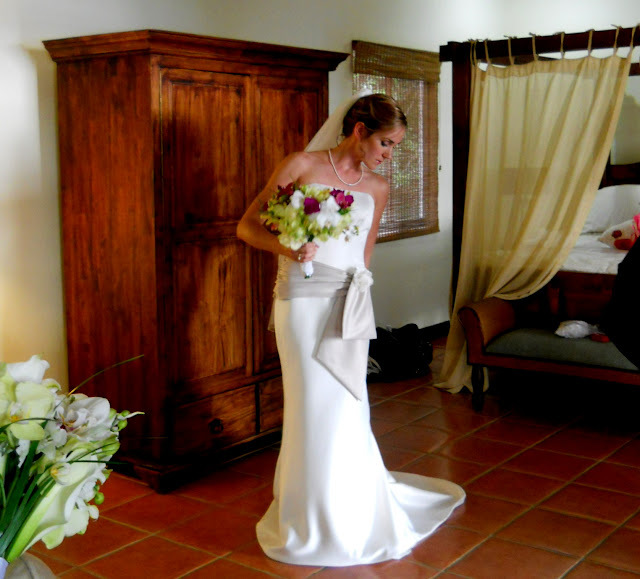 The view is indescribable and the villa itself is open and airy - perfect for an unforgettable wedding & reception! 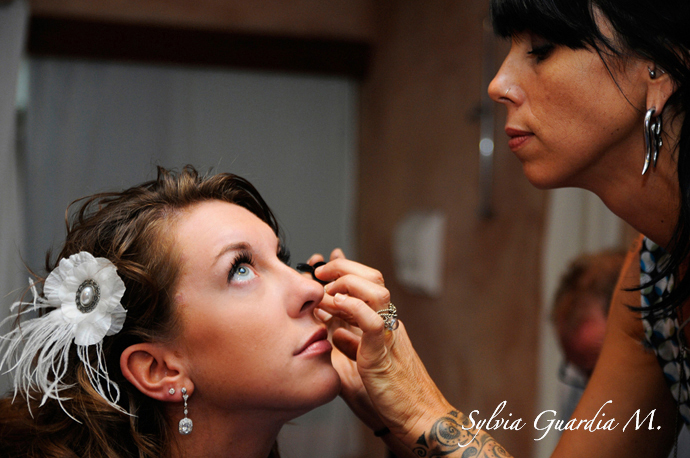 We arrived mid-morning and got to work doing the make-up and hair for Sarah and her beautiful bride's maids. The view from the villa is spectacular -- can you think of a better place to "work"? Sarah wanted golden, shimmery (yet soft) eyes. We used a combination of dark brown & black liners along with Urban Decay's colors, Half Baked, Smog, Sin & Virgin from the Naked (1) palette to create this. 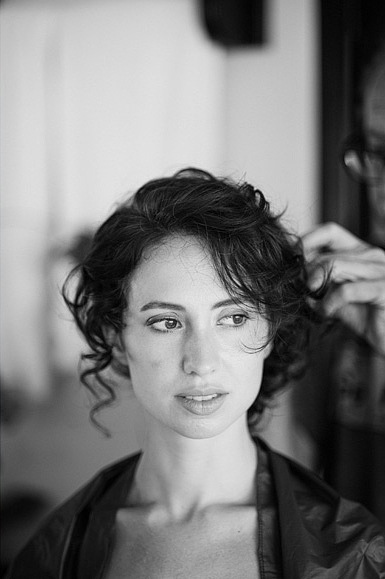 Nick worked his magic creating 6 unique updos combining curls and braids to give all the ladies elegant yet beachy hair. I love this dreamy video made by Jonathan Yonkers. I feel like I'm re-living the wedding through someone else's memory. Lindsay & Chino got married in Sugar Beach. This was the first time I had ventured up to this lovely, secluded, off the beaten path location. 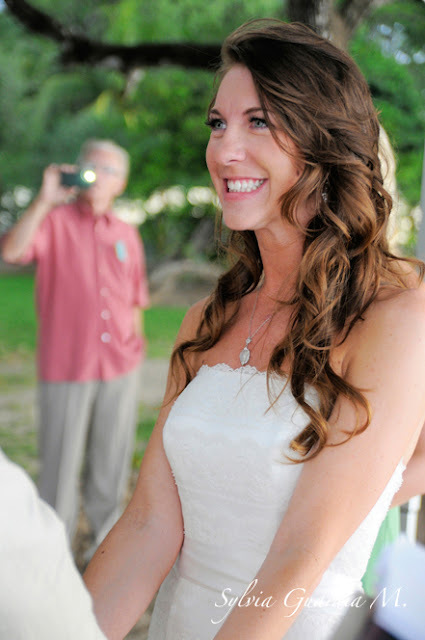 The Hotel Sugar Beach is a great location for both a ceremony and reception. 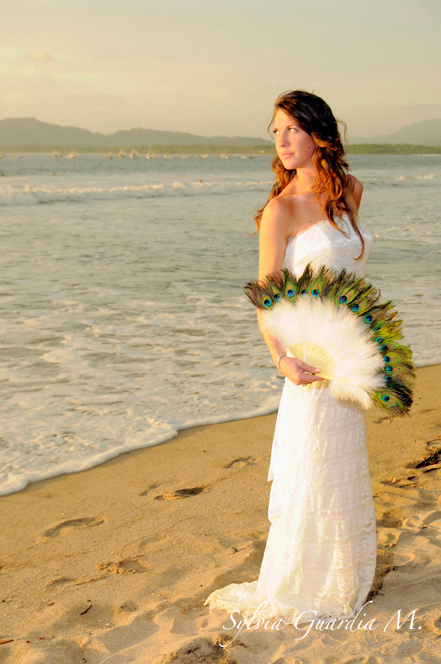 The beach out front, a picturesque cove, will take your breath away -- but really, which beach in Costa Rica doesn't??? 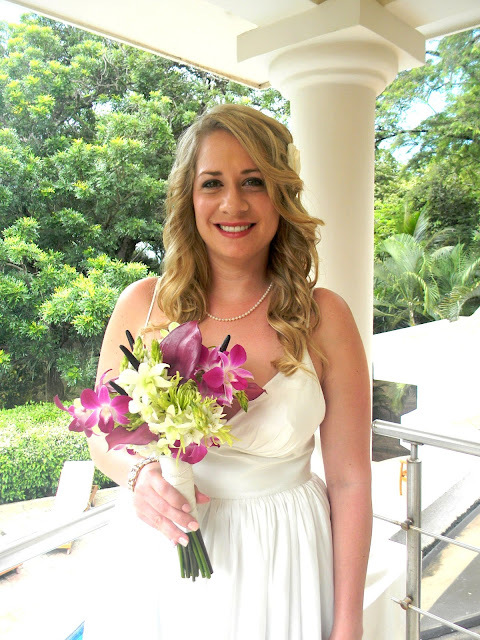 Lindsay is a U.S. citizen that met her Costa Rican husband, Chino, after moving here to do mission work. They had a good turnout of guests from both her family and his - which provided a lovely blend of cultures. 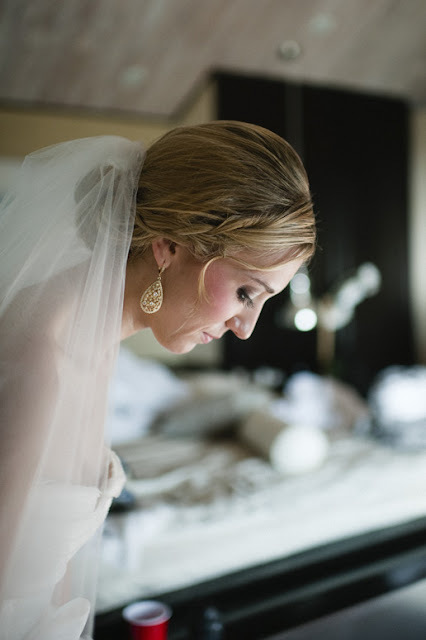 Jonathan Yonkers created this beautiful wedding highlight video. Can't you can just feel the love oozing between these two!?!? 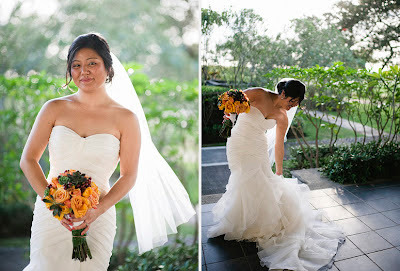 Insanely beautiful, backless crocheted wedding gown. I came across this photo uploaded by a user on Pinterest and tried (unsuccessfully) to find out where it originated from and who the maker was. It is nothing short of spectacular! I'm in love. 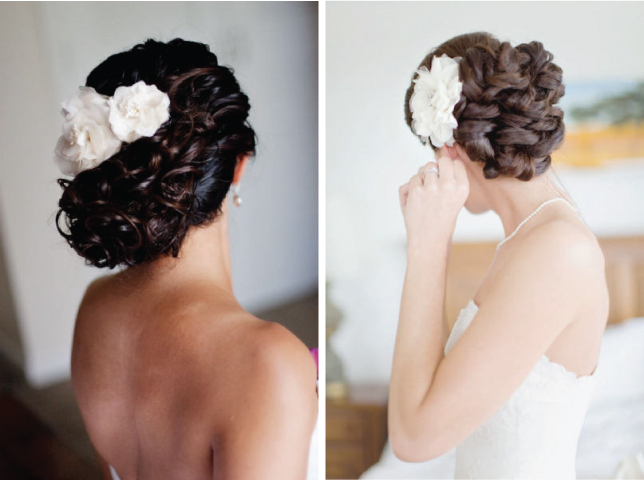 Another great hairstyle found on Pinterest. 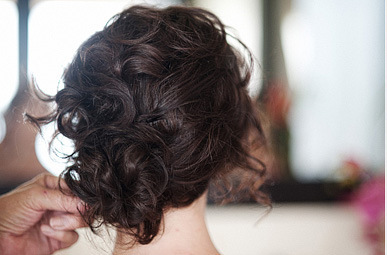 This loose updo with a twist and lots of body is perfect for a tropical beach wedding. I came across this photo uploaded by a user on Pinterest (I love that website!!). I love the glowing, dewy look of her make-up. Perfect for a beach wedding. Rachel was a blast to say the least. 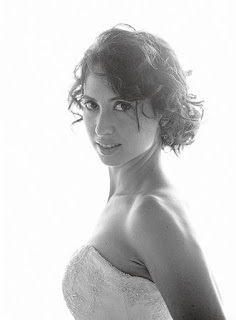 A laid back and ultra relaxed bride -- well maybe a little too relaxed. 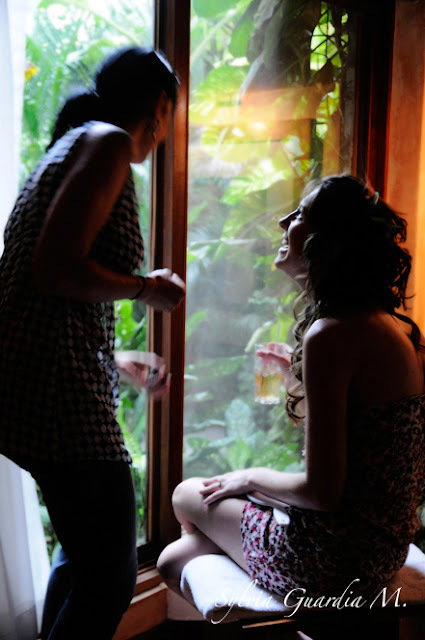 :) So relaxed that they forgot her wedding dress at home, missed flights and then, as we were getting her all gorgeous, realizing they had left the groom's pants at home. But there was nothing that was going to ruin their day. She looked amazing! 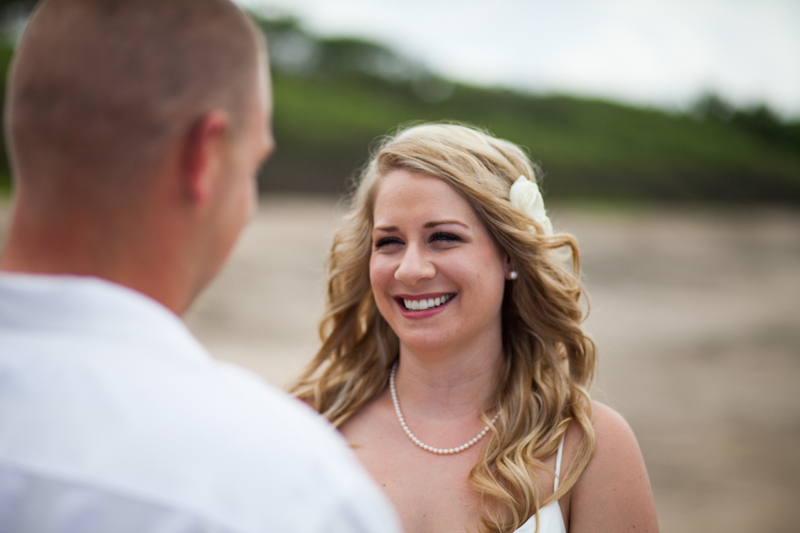 Photographer Syliva Guardia did an awesome job of capturing the happiness oozing from this couple! Sidenote: Rachel opted to have long wearing lash extensions applied before her trip. 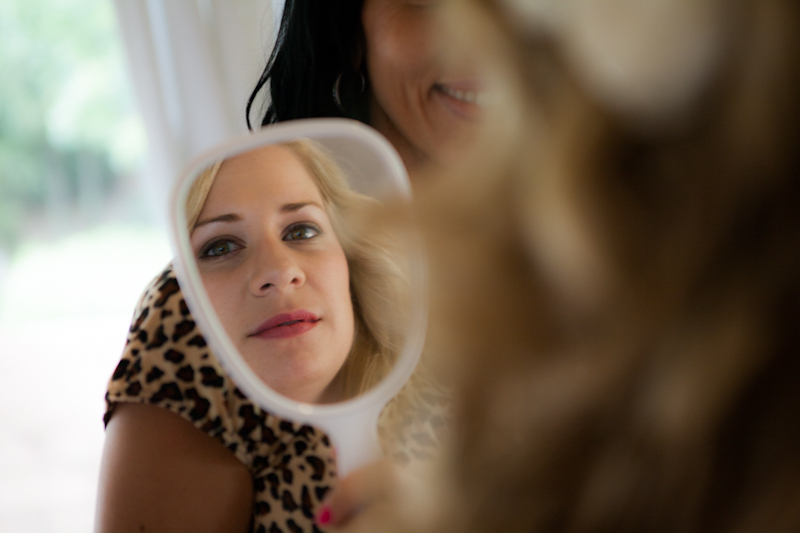 This is a great option to wearing false eyelashes. They are water resistant, they don't get complicated with the humidity and look amazing. 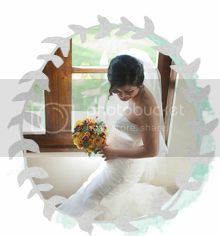 Sometimes you meet couples that are so incredibly s-w-e-e-t and romantic that it gives you butterflies in your stomach! Peter & Nicole were that kinda' couple. 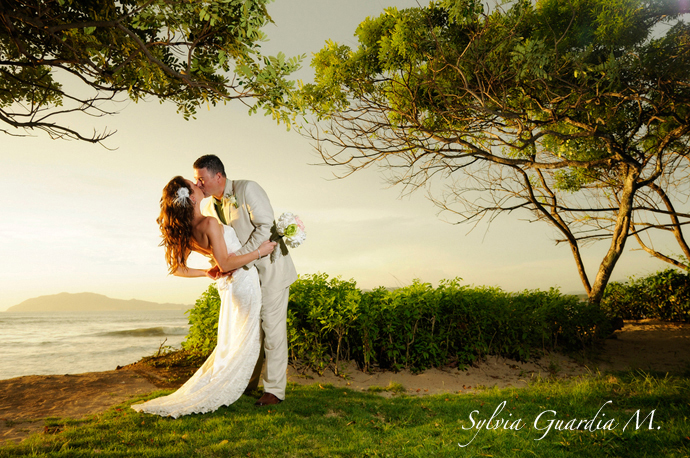 Nicole was a knock-out and El Velo did a great job of capturing the romance that oozed from this couple! 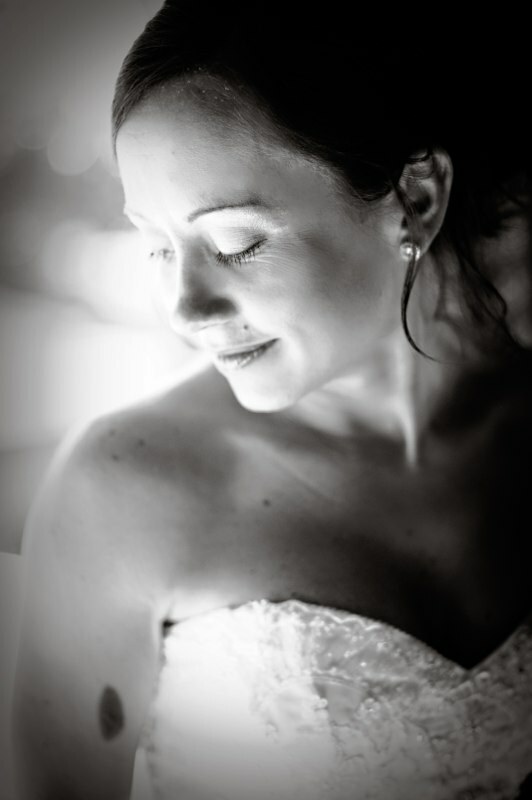 More photos of Nicole & Peter's gorgeous wedding can be seen on El Velo's website. 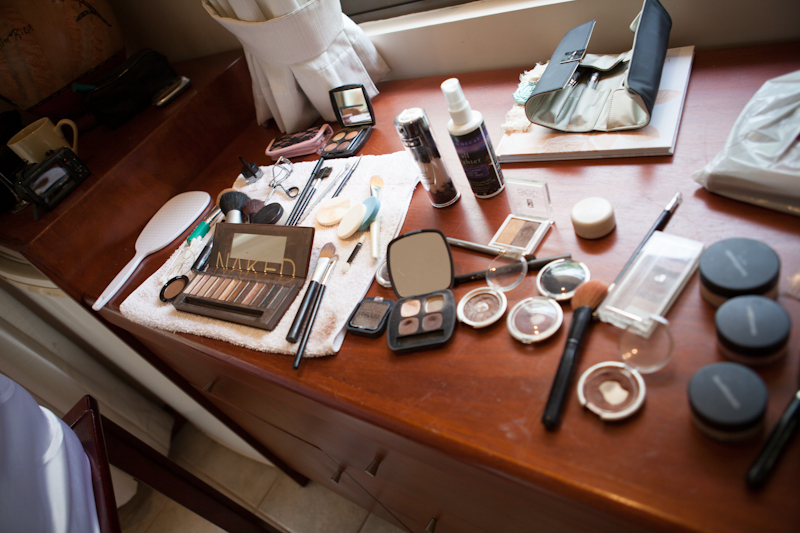 A lil' messy...perfect for a beach wedding. There curves and movement in this style. Highlights really accentuate that the direction of the hair. Leaving bang loose softens it up a bit. By the way, isn't this backless gown divine?? 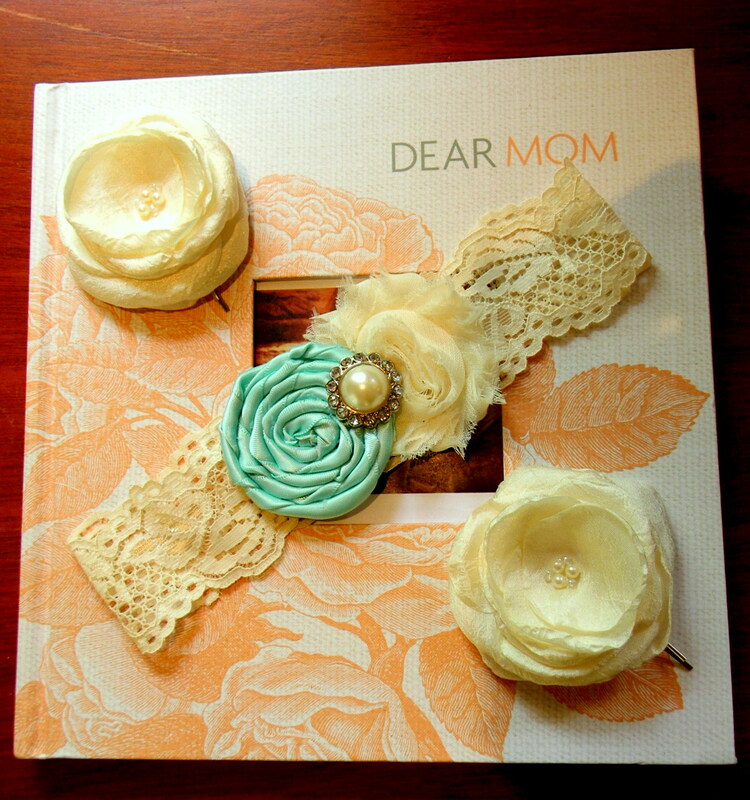 Plus -- it creates a nice little spot to nestle your flowers or other hair accessories. Wedding Coordinator Four Winds Weddings organized the perfect outdoor ceremony and gorgeous reception at one of my favorite venues in Tamarindo, Villa Paraiso. 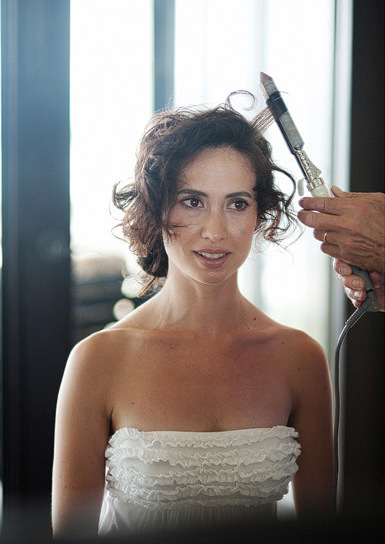 Megan & Nick worked together to create this beachy, loose curls updo. Photographer: Julie and Marguax of Comfort Studio. 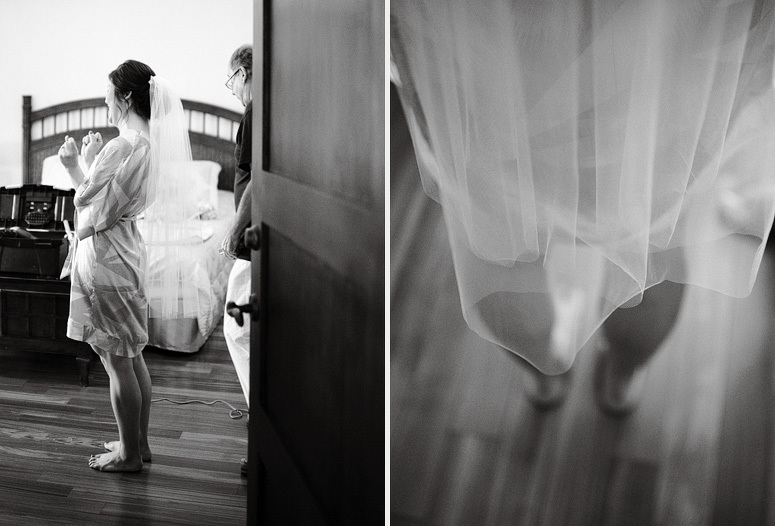 More photos of Megan & Robert's wedding can be found on Comfort Studio's blog. 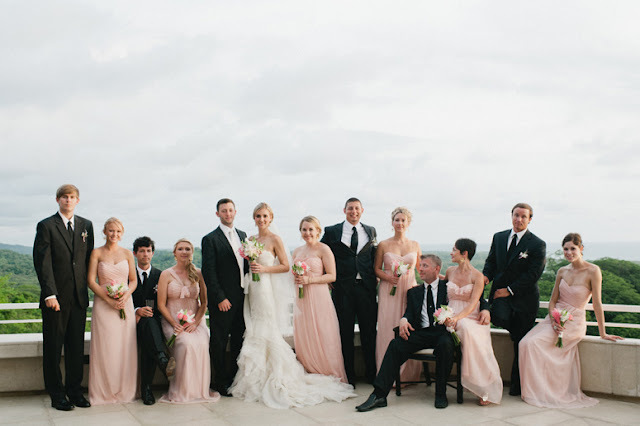 This wedding was featured on Style Me Pretty. 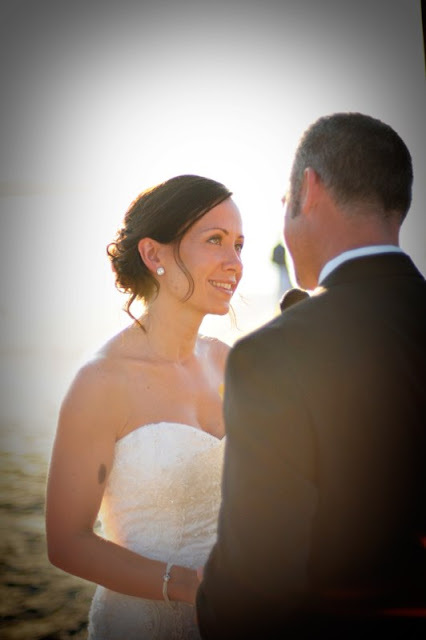 We had a great time working with Ann and Mark to make their special day wonderful! We met with them prior for a trial hair and make-up session and so when their wedding day rolled around, we were ready to go! Everyone turned out beautiful. Ann & Mark's wedding was also featured on DIY Bride.